1. U.S. Census Bureau, 2015 American Community Survey 1-year estimates, Table B17016. 2. Data Resource Center for Child & Adolescent Health, National Survey of Children’s Health, 2011/12. 26,678 babies were born in 2015. That’s a slight decrease from 26,794 births in 2014. 16% of babies received inadequate prenatal care. 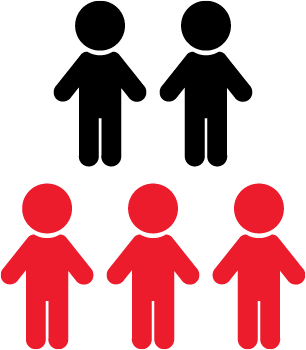 In 2015, there were 8 children ages 0-11 and 12 children ages 12-19 living with HIV. Since 2005, only 3 children with a diagnosis of HIV or AIDS have died from the disease. There were 2,303 cases of sexually transmitted infections reported in children ages 19 and under in Nebraska in 2015. Infant mortality decreased to 5.1 per 1,000 births in 2014 from 5.3 per 1,000 births in 2013. In 2014, 125 children and youth ages 1 to 19 died of various causes, the most common of which were accidents and suicide. *2015 mortality data was unavailable at the time of publication of this report. When data is made available it will be updated electronically in this report and in the Nebraska Kids Count NEteractive Data Center found at voicesforchildren.com. 1. U.S. Census Bureau, 2015 American Community Survey 1-year estimates, Table B27016. 2. U.S. Census Bureau, 2014 American Community Survey 5-year estimates, Tables C27001B-I. An estimated 37,539 Nebraska children face behavioral health disorders. Source: Data Resource Center for Child and Adolescent Health, childhealthdata.org. 1. Financial and Program Analysis Unit, Department of Health and Human Services (DHHS). 2. National Survey of Children’s Health, 2011/12. 3. Centers for Disease Control and Prevention, Youth Risk Behavior Survey. 4. Division of Behavioral Health, Department of Health and Human Services (DHHS). 15 children died and 135 children suffered disabling injuries in motor vehicle accidents. the same as 1.1% in 2014. Source: Child Trends, Adverse Childhood Experiences, National and State Level Prevalence, 2014. Nebraska’s Network of Domestic Violence/Sexual Assault Programs includes 20 community-based programs. There are also four tribal programs which comprise the Nebraska Tribal Coalition Ending Family Violence. The tribal domestic violence/sexual assault programs are with the Winnebago Tribe of Nebraska, the Santee Sioux Nation, the Ponca Tribe of Nebraska, and the Omaha Tribe. Medically underserved areas (MUA) or populations (MUP) are defined as those where residents may have access to too few primary care providers, have high infant mortality rates, have high poverty, and/or a high elderly population. 73.8% of Nebraska children had received the primary immunization series* by age three. 78.1% of Nebraska teens were immunized against meningitis. 48.2% of Nebraska teen girls and 32.2% of Nebraska teen boys completed the 3rd round of the HPV vaccine. 2. 2011/12 National Survey of Children’s Health.